1-to-1 iPad in higher education. When it comes to providing students with an education that prepares them for today’s competitive, modern world, educators at Maryville University believe they’re setting their students up for success. Though uncommon in higher education, a 1-to-1 iPad program, supported with Apple School Manager, allows Maryville educators the opportunity to challenge the historical norm and deliver a hands-on experience that allows each student to thrive with their own unique learning style. Sound too good to be true? 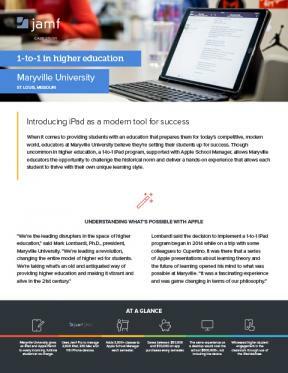 Let Maryville explain why you too can succeed and save with an Apple iPad program at your university.